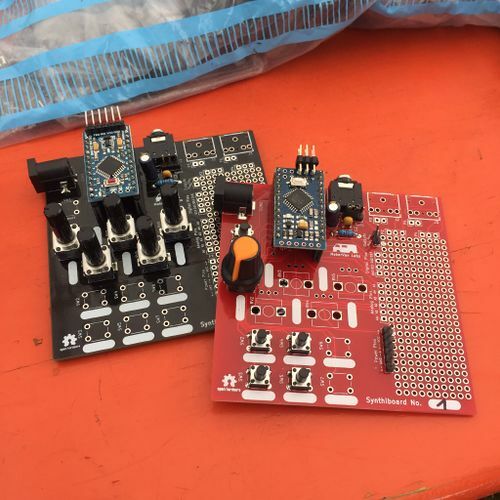 I've brought some kits to build an Auduino Synthesizer, or a small drum machine. There are 10 kits, they're 20€ each (cash please), first come, first serve. Find more information on the boards and kits over here. We'll build the kits, get the firmware on them, and play around with it a bit. I've brought some already assembled synths if you want to try them out before deciding which one to build. Bring you own laptop (with the Arduino IDE installed) and an FTDI cable if you can, to play with the firmware. Otherwise, I can flash you the firmware of your choice. If you're still interested afterwards, we can play around with the firmwares a bit and try to get more funny sounds out of our synths. This page was last modified on 6 August 2017, at 18:12.